TORONTO (AP) Raptors guards DeMar DeRozan and Kyle Lowry are bringing their coach along to next month’s NBA All-Star Game. 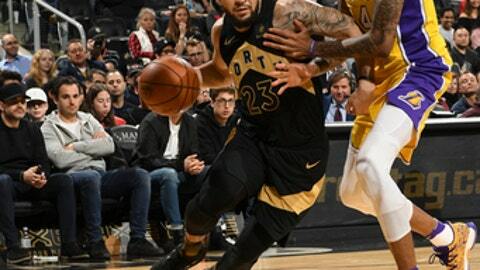 Fred VanVleet scored a career-high 25 points, DeRozan had 19 and the Raptors beat Los Angeles 123-111 on Sunday to snap the Lakers’ winning streak at four games. The victory guarantees the Raptors (33-15) will have the second-best record in the Eastern Conference through Feb. 4, meaning Dwane Casey will coach Team LeBron at next month’s All-Star Game in Los Angeles. Brad Stevens, whose Boston Celtics lead the Eastern Conference, is ineligible after coaching last year’s game. Lowry showered Casey with water during a postgame celebration inside the Raptors’ locker room. Casey said it was an ”honor” to represent the East on All-Star weekend. ”To put a light on our program and see what we’re doing is the most important thing,” Casey said. Lakers: G Alex Caruso scored a career-high 11 points. … F Nigel Hayes, whose 10-day contract expired following the game, will not be offered a new contract. Raptors: Toronto has not lost to the Lakers since a 129-122 overtime defeat at Los Angeles on Nov. 30, 2014. … Eight different Raptors made at least one 3-pointer. … DeRozan had a game-high seven assists. … Former Toronto Blue Jays star Joe Carter attended the game. Lakers: Visit Orlando on Wednesday, their third stop on a season-long five-game road trip. It’s the first meeting of the season between the teams.